I have always said that ignorance is a far greater problem to society than poverty. Despite the impact of Christianity, education, civilization and a law formally abolishing the Osu caste (Outcast) system in southeastern Nigeria’s Igboland, class discrimination within Africa and other countries throughout the world is still prevalent today. 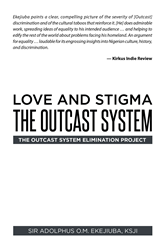 In “Love and Stigma: The Outcast System,” Nigerian author Sir Adolphus Ekejiuba includes 50 years of research, applying scientific, religious and sociological lines of thought to disprove a staunchly held cultural practice that encourages discrimination and stigma within Nigeria, India and other countries. Through his book, Ekejiuba hopes to abolish the outcast system and achieve freedom, justice and peace for people who have been stigmatized and discriminated against for ages. For more information, visit http://www.adolphusekejiuba.net. Sir Adolphus Ekejiuba is a retired geologist with the Shell Petroleum Development Company of Nigeria. He is an avid world traveler and philanthropist, contributing significantly to his community development and well-being of the less privileged. He is the founder of the Adolphus Ekejiuba Foundation, a philanthropic organization aimed to reach out to Nigerian youth to curtail restiveness, laziness, ignorance and disease. For more information about the Adolphus Ekejiuba Foundation, visit http://www.adolphusekejiubafoundation.org.